Using over-the-counter nasal sprays to minimize the discomfort and swelling caused by hay fever and allergies is common. Most people find a congested and stuffy nose miserable and problematic. But many people may not realize that by using the nasal decongestant sprays for more than three consecutive days, it may cause greater difficulty breathing as well as damage to the nose. A recent article HealthCentral online article notes that millions of Americans turn to over-the-counter (OTC) nasal sprays as a quick—and presumably safe—remedy for sinus pressure and stuffy nose. The article also cautions that using topical nasal decongestants (TNDs) for a prolonged period of time often leads to addiction. Cited was a case in which one individual began using a TND at bedtime to alleviate a stuffy nose that caused him trouble sleeping. He found that TND use before bedtime made him feel better. Within 2 weeks times, this individual began waking during the night, needing another dose of TND to obtain relief. One month later, 4 daily doses of TND were required to avoid severe nasal congestion. By the time a year passed, this same individual was using nearly one bottle of TND daily. He was diagnosed with Rhinitis Medicamentosa (RM). Rhinitis means nasal inflammation. Medicamentosa means from medication. In other words, he was suffering from nasal inflammation caused by the medication itself—the TND. According to the article, TNDs are liquid medications (such as Extreme Congestion, Afrin, Zicam, Neosynephrine) which are surface active. When sprayed into the nose, they cause constriction of the small arterial blood vessels in the nose lining. As a result, nasal congestion decreases rapidly—within minutes. The nose is somewhat dry, and more open. Long-acting TND formulation last for 12 hours initially. Early in their use, people think it may be the cure for sinus problems. What is not known is that more than 5 days of continued use markedly increases the risk of addiction. Topical nasal spray addiction does not change brain structure as heroin and cocaine do. Habitual use, however, can lead to compulsive use, and TNDs eventually cause physical damage. The recommended use of TNDs is three consecutive days only. When used longer, the receptors in the arteries of the nose decrease in number. The decongestant effect of the TND gets shorter and shorter with continued use. The shortened duration of relief commonly leads to using the TND more often. As the effects of the nasal spray wears off, the user experiences what is called rebound congestion—aworsening of the original congestion. There is now a dependence on the medication to keep the nasal blood vessels constricted. Similar to other drug tolerance, the nose develops a tolerance to the TND medication, and requires more and more to achieve the desired beneficial effect. 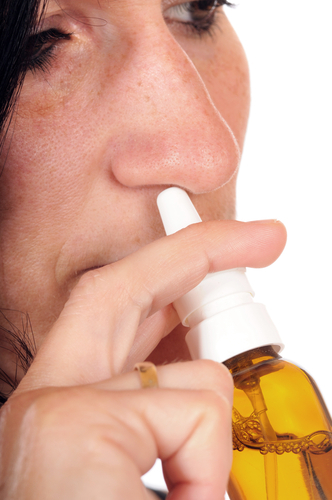 Eventually, the TND becomes more or less ineffective in relieving the nasal congestion. RM can be treated. Some doctors taper (reduce gradually) the person down over a number of days. An alternative is a nasal steroid spray, considered non-addictive and which are medically prescribed for long-term use. The use of steroids is known to have its own side effects, and a person is wise to do their own due-diligence and weigh the facts for themselves. Avoiding the use of TNDs altogether may very well be the best prevention. If choosing to ahead and use a TND, ensure use is limited to 3 days or less, and never more than a few times per year. Seeking the help of an allergist may help those who suffer a recurring or moderate to severe problem with nasal and sinus congestion. Read ingredient labels carefully on any and all over-the-counter nasal decongestant product. Ingredients to avoid include Naphazoline, Xylometazoline, Phenylephrine, and Oxymetazoline. Being well-informed and knowledgeable is the best prevention.